Eric grew up in Utah and had a variety of jobs once he finished school. He had worked in movie theaters as an usher. He also took classes to become a certified nursing assistant, and worked in that field for several years. At the same time, Eric joined some friends who volunteered for advocacy organizations and community leadership programs, and discovered how much he liked that type of work. He especially enjoyed testifying in legislative hearings and learning new ways to communicate, such as People First language. When he and his family decided to move to Seattle in 2008, Eric thought about how he could continue to do advocacy work there. When he got to Washington, Eric decided to volunteer for his local Arc. At first he helped out by stuffing envelopes and doing other jobs as needed. As he got to know people there and learned more about their work, he took on a greater variety of tasks and eventually joined their board of directors. People recognized Eric's passion, commitment to people with IDD, and leadership potential while he was on the board. By showing up for board meetings and participating in discussions and projects, Eric communicated that he really wanted a job helping people with IDD to have more opportunities. A coworker encouraged him to apply for a position as a part-time advocacy coordinator and outreach specialist. In this position, Eric became interested in helping people with IDD understand that they can be part of the process for making and changing laws. He was promoted to a full-time position in 2010 because he insisted that he could do so much more if he worked full time. Since early 2010, Eric has been working full time as the coordinator of the advocacy program for the Arc of King County. He speaks to transition -age students and their parents about the value of community employment. He shares stories about the jobs that he has had in the past, and tips on how people can find the job that they want. He also presents to community groups on various topics, including acceptance and respect of people with IDD. 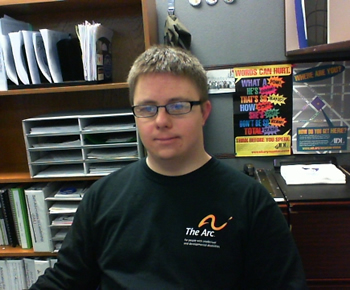 Eric encourages other individuals with IDD to speak up for themselves through The Arc University. This is a program of Saturday classes for people with IDD at the University of Washington. Eric organizes bus trips to the state capital during the legislative session, to give people an opportunity to be involved in the legislative process and meet with their legislators. He also calls and meets with legislators to bring issues to their attention, and organizes opportunities for other people to learn about how the political process works. Because Eric has many different responsibilities at work, he has come up with ways to get everything done. He has one-on-one meetings with his supervisor during which they create and prioritize task lists. Eric used to rely on coworkers to drive him to various meetings, but when he noticed that they were taking time out from their own work to drive him, he decided to learn about public transportation so he could be more independent. He has a job coach who comes once a week and provides support to manage email and master work-related software. While Eric was doing other jobs, he volunteered at advocacy and leadership organizations where he developed a professional passion. When a paid position in an advocacy organization presented itself, Eric was prepared to apply for it. Eric's responsibilities grew as he moved from part-time to full-time work. He and his supervisor came up with strategies to stay organized, such as the list of highlighted tasks, email support, and training on new office programs. Learning to travel on his own also helped him to get more work done.